EDITOR'S NOTE Broadband Communities (ISSN 0745-8711) (USPS 679-050) (Publication Mail Agreement #1271091) is published 7 times a year at a rate of $24 per year by Broadband Properties LLC, 1909 Avenue G, Rosenberg, TX 77471. Periodical postage paid at Rosenberg, TX, and additional mailing offices. POSTMASTER: Please send address changes to Broadband Communities, PO Box 303, Congers, NY 10920-9852. CANADA POST: Publications Mail Agreement #40612608. Canada Returns to be sent to Bleuchip International, PO Box 25542, London, ON N6C 6B2. Copyright © 2018 Broadband Properties LLC. All rights reserved. CEO Barbara DeGarmo / barbara@bbcmag.com PUBLISHER Nancy McCain / nancym@bbcmag.com E D I TO R - I N - C H I E F Masha Zager / masha@bbcmag.com E D I TO R -AT- L A R G E Steven S. Ross / steve@bbcmag.com ADV ER T ISING SALES ACCO U N T E X E C U T I V E Irene Prescott / irene@bbcmag.com E V E N T S CO O R D I N ATO R Dennise Argil / dennise@bbcmag.com CO M M U N I T Y N E W S E D I TO R Marianne Cotter / marianne@bbcmag.com AR T DIR EC TOR Karry Thomas CO N T R I B U TO R S Rollie Cole, Sagamore Institute for Policy Research David Daugherty, Korcett Holdings Inc. Joanne Hovis, CTC Technology & Energy Michael A. Kashmer, Digital Broadband Programming Consultant W. James MacNaughton, Esq. Christopher Mitchell, Institute for Local Self-Reliance Henry Pye, RealPage, Inc. Bryan Rader, UpStream Network Craig Settles, Gigabit Nation Robert L. Vogelsang, Broadband Communities Magazine B ROAD BAN D PRO PE R TI E S LLC CEO Barbara DeGarmo V ICE PR ESIDEN T, BUSINESS & OPER AT I ONS Nancy McCain CHAIR MAN OF T HE BOAR D Robert L. Vogelsang BUSINESS & EDI TOR IAL OFFICE BROADBAND PROPER T IES LLC 19 09 Avenue G • Rosenb erg, T X 77471 281. 342.9 655 • Fa x 281. 342.1158 w w w. bro adb andcommunities .com masha@bbcmag.com 2 | B R O A D B A N D C O M M U N I T I E S | w w w. b r o a d b a n d c o m m u n i t i e s . c o m | A U G U S T / S E P T E M B E R 2 0 1 8 T o help prepare for the Fiber for the New Economy conference (held this year in Ontario, California, from October 23 to 25 – don't miss it! 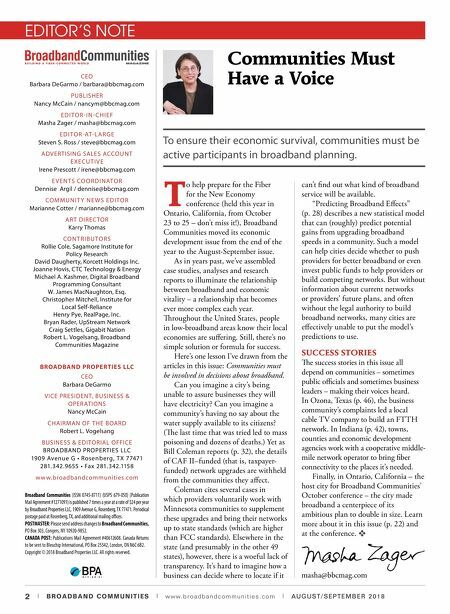 ), Broadband Communities moved its economic development issue from the end of the year to the August-September issue. As in years past, we've assembled case studies, analyses and research reports to illuminate the relationship between broadband and economic vitality – a relationship that becomes ever more complex each year. roughout the United States, people in low-broadband areas know their local economies are suffering. Still, there's no simple solution or formula for success. Here's one lesson I've drawn from the articles in this issue: Communities must be involved in decisions about broadband. Can you imagine a city's being unable to assure businesses they will have electricity? Can you imagine a community's having no say about the water supply available to its citizens? (e last time that was tried led to mass poisoning and dozens of deaths.) Yet as Bill Coleman reports (p. 32), the details of CAF II–funded (that is, taxpayer- funded) network upgrades are withheld from the communities they affect. Coleman cites several cases in which providers voluntarily work with Minnesota communities to supplement these upgrades and bring their networks up to state standards (which are higher than FCC standards). Elsewhere in the state (and presumably in the other 49 states), however, there is a woeful lack of transparency. It's hard to imagine how a business can decide where to locate if it can't find out what kind of broadband service will be available. "Predicting Broadband Effects" (p. 28) describes a new statistical model that can (roughly) predict potential gains from upgrading broadband speeds in a community. Such a model can help cities decide whether to push providers for better broadband or even invest public funds to help providers or build competing networks. But without information about current networks or providers' future plans, and often without the legal authority to build broadband networks, many cities are effectively unable to put the model's predictions to use. SUCCESS STORIES e success stories in this issue all depend on communities – sometimes public officials and sometimes business leaders – making their voices heard. In Ozona, Texas (p. 46), the business community's complaints led a local cable TV company to build an FTTH network. In Indiana (p. 42), towns, counties and economic development agencies work with a cooperative middle- mile network operator to bring fiber connectivity to the places it's needed. Finally, in Ontario, California – the host city for Broadband Communities' October conference – the city made broadband a centerpiece of its ambitious plan to double in size. 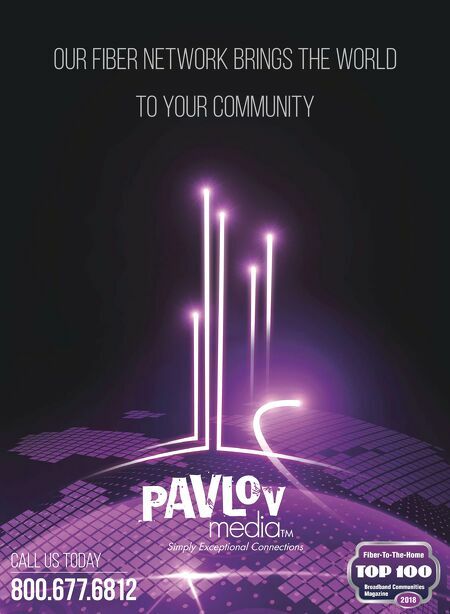 Learn more about it in this issue (p. 22) and at the conference. v Communities Must Have a Voice To ensure their economic survival, communities must be active participants in broadband planning.